According to reports the Spanish daily El Pais ended after midnight CNN + emissions after 11 years on the air. It was the first private television which broadcast information 24 hours a day and its way of doing journalism "rigorous and independent, consolidated a mark reached an ideological balance where everyone could" in the words of one of its founders, Francisco Basterra. A brand also helped create such an innovative way to communicate and their recognized areas of debate. The end of this adventure takes place after the TV PRISA (group editor of El País) quit producing the channel following the merger between Telecinco and Cuatro. PRISA had the option of renting a channel for a maximum of three years. To give it up the chain will be operated by its new owner, Telecinco, which has confirmed that initially devoted to reality show Big Brother. PRISA Group plans to create a new global news channel to new platforms. 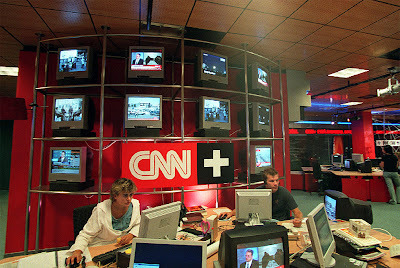 CNN + resulted in the alliance between the main group of Spanish-language media, PRISA and the global network of reference news, CNN. "It was a good idea and has shown a balanced way of doing journalism in a time not long ago this for civic culture. With closure, the Spanish media loses," said Basterra. Ending 11 years in which the canal passed through different business models but never found economic viability. CNN + was born in January 1999 as part of the platform Sogecable's satellite television and from the start, according to its leaders, was deficient. In 2008 the channel became widespread in open DTT, implying financed exclusively by advertising revenue. To this was not sufficient for a hearing that was 0.2% in 2008 and 0.3% in 2009. This resulted, according to a spokesman said yesterday PRISA TV, "a poor advertising revenue to the channel leading to significant losses." In early 2010 introduced significant changes in programming, which went from the traditional news conference revolve around a series of major programs in the morning, afternoon and evening. This, together with the full deployment of DTT, resulted in a significant rise from the audience (from 0.3% to 0.6%) and an increase in turnover, but according to spokesman PRISA TV was not enough to prevent the channel again to close the year with heavy losses and "no prospect of profitability in the medium term." In the past three years, since the issues in open, CNN + accumulated losses in excess of 40 million and more favorable projections calculated similar data in the next three years. "Unfortunately we have a problem operating margins or reduce costs, but not viable in the chain, even if we wanted to continue to provide quality service as coming by CNN +," the spokesman said. "Separation of Four, string to CNN + has shared structure and wording, aggravate the situation. In fact, throughout the world, these channels survive with difficulty in large public or private television structures that operate multiple channels and optimize the exploitation of them. The model is not sustainable in itself and less in the current economic times, "added the spokesman. "But also, the profound transformation that is underway in the audiovisual dispute that, as expensive as a DTT with a model as irrational as shown in Spain, is this the right way to develop a current channel" . In PRISA TV show that it is not viable under the current system may be through a platform supported on new technologies, which allow to produce and distribute content in a less costly and more responsive to the preferences of users in Spain and global market of Spanish. "It that's what we will devote our efforts to explore the possibility of launching a channel with a global current, supported PRISA brands are the international reference, like the country, or those that already have a strong presence in the Spanish market. " For this project, carried on CNN + over these 11 years is a benchmark of quality and good craftsmanship. "It was a channel that, perhaps more than any other in Spain, has been closely following the pulse of the political, cultural and social aspects of our country. Without any doubt, has been a window to the world for a decade. quality work that merits recognition by the company to journalists, technical staff, collaborators and all professionals who have made this possible, as well as viewers and advertisers who have supported this project, "said spokesman PRISA TV . The Federation of Journalists in Spain (FAPE) yesterday issued a statement regretting the loss of this chain, which represented "a space for debate, to exchange ideas, for reflection and training criteria." "Society", he adds, "is more helpless before the power and weaken democracy." The FAPE reported that the journalistic profession has lost 3,496 jobs since November 2008. Closing CNN + also has led to protests from the Works of Sogecable. The presenters of the various programs have been firing on the air one after another in recent days. So did Iñaki Gabilondo, José Antonio or San José María Calleja, among others, praising all the good work of a team "that could be fitted with another TV right now," said Basterra yesterday. "There can be no sense of closure because something was done wrong, it is economic conditions. This channel was necessary and leave a gap of journalism," he concluded.